Neil Young's three consecutive early 1970's albums "Time Fades Away", "On The Beach" and Tonight's The Night are considered by many fans the Rosetta Stone to understanding his entire body of work. Because of their dark, haunting brilliance, the albums are known as "The Ditch Trilogy". In the often quoted hand written liner notes of Decade, Neil writes: " 'Heart of Gold' put me in the middle of the road. Traveling there soon became a bore so I headed for the ditch." Hence, the origin of the "Ditch" term -- which is sometimes also referred to as the "Doom" period or "The Wilderness Years". The impetus for the heart of darkness spiral can be traced back to Harvest's "The Needle and The Damage Done", Young's legendary anti-drug plea based on the heroin trouble's of Crazy Horse guitarist Danny Whitten. 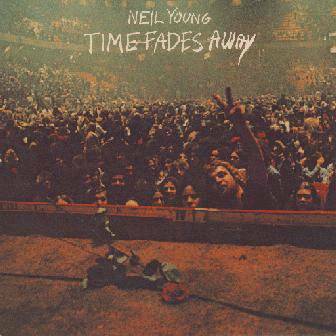 Neil Young's 1973 "Time Fades Away" is one of the most remarkable live albums ever recorded. Certainly at the time of release, it was almost unprecedented for an artist to release a live concert recording of previously unreleased material. Long out of print on vinyl and still unavailable on CD in the early 21st century, the album is considered to be the "Holy Grail" of all Neil Young albums and the "missing link" of the "Ditch Trilogy". "Time Fades Away" is the first installment of the trio of albums known as the "Ditch Trilogy". The edgy moody darkness of recording and brilliantly erratic song selection offer the portrait of the artist undergoing a deep catharsis and excorcising demons which is so palpable that most listeners turned away -- or worse ignored completely. YOUNG: "Well, we didn't put any of Time Fades Away on Decade, if that's what you mean." "This album is an honest document of a very difficult period in Neil Young's life, both in musical and personal terms. The descent into darkness continued during the sessions for Tonight's the Night, which started soon after this album was assembled and mastered. The safe thing would have been not to release these songs at all and let the tour diminish into memory. Luckily, Neil Young has never done the safe thing." The ever harsh critic Dave Marsh writes that "Time Fades Away" was "erratic, occasionally explosive, flying in the face of soft rock convention with more screeching guitars, scattered rhythms and a generally rowdy approach." Neil Young's "Tonight's The Night" is considered to be his 'darkest' album - both literally and figuratively - and the last of the "Ditch" trilogy in release order. Although released in 1975, the album was actually recorded in 1973 after the disastrous Times Fade Away tour. Chronologically, "Tonight's The Night" is actually the second of the "Ditch Trilogy" albums. The album explores the depth of Neil's pain over the heroin overdose deaths of Crazy Horse's Danny Whitten and roadie Bruce Berry. The bookends of Tonight's The Night are the title track which opens acoustic and concludes electrically. This unplugged and plugged approach which Neil pioneered in 1973 was continued again later with the acoustic "My My, Hey Hey (Out of the Blue)" and electric "Hey Hey, My My (Into the Black)" on 1979's Rust Never Sleeps and again on 1989's Freedom's "Rockin In The Free World" acoustic and electric version. The unplugged theme would later become a phenomenon in the 1990's with MTV's Unplugged series. Neil: "Yeah, we did. The plot was about a roadie who made it and then OD'd on drugs. 'From Roadie To Riches' was the name of it (laughs). For Broadway in 1974 it was a little ahead of its time, as you can imagine. " "Tonight's the Night is like an overdose letter - the whole thing is about life, dope, and death. 'I probably feel this album more than anything else I've ever done,' said Neil Young in Rolling Stone (August 14, 1975). I also feel this album - more than any other Neil Young album, or any album ever - completely captures the essence of what I believe makes Neil Young such a great artist: His ability to put his mood, his beliefs, and himself into his work." Neil Young's 1974 "On The Beach" has long been hailed as a masterpiece. The album's infamous "blues trilogy" of "Revolution Blues", "Vampire Blues", and "Ambulance Blues" have provided rich fodder for analysis and commentary of the song's lyrics . The "blues trilogy" is considered by many fans some of Neil's richest and most metaphorical work. "Thirty years on this remains an essential album if you ever want to get even the slightest glimpse of what makes Young an enigma and a genius." "The hard-edged sound of On The Beach is a contributing factor to its greatness, since the album poses aesthetic and political questions too serious to be treated prettily. Through various opposed personae, Young evokes primary social and psychic polarities that exemplify the deterioration of American culture. Though not named, the figures of Charles Manson and Patricia Hearst appear as emblems of apocalyptic social dislocation in the album's two masterpieces, "Revolution Blues" and "Ambulance Blues." In each song, by empathizing with the emotions of both predators and victims, Young has dared what no other major white rock artist (except John Lennon) has - to embrace, expose and perhaps help purge the collective paranoia and guilt of an insane society, acting it out without apology or explanation." "After "Harvest" had clocked up sales running into millions, Young's fans were horrified first by the release of the double album "Journey Through The Past", a bitty and meaningless "soundtrack" for Young's rarely-seen film of the same name. After the album came out, the film company refused to release the movie, to Young's continuing disgust. Next came the nerve-shredding live album "Time Fades Away", a dingy and macabre affair notably devoid of the pure melodies beloved of his soft-rockin' aficionados. Young, feeling boxed in by commercial success, had steered away from it. The chart performance of "Heart Of Gold" had brought him a lot of things he found he didn't want. "I guess at that point I'd attained a lot of fame and everything that you dream about when you're a teenager. I was still only 23 or 24, and I realised I had a long way to go and this wasn't going to be the most satisfying thing, just sittin' around basking in the glory of having a hit record. It's really a very shallow experience, it's actually a very empty experience. It's nothing concrete except ego-gratification, which is extremely unnerving kind of feeling. So I think subconsciously I set out to destroy that and rip it down, before it surrounded me. I could feel a wall building up around me." To add insult to injury, his next studio recording was the harrowing "Tonight's The Night", though with a perversity that was becoming typical of him the latter wasn't released until after the subsequently-cut "On The Beach". Both albums stand up strongly to this day. Both use the rock format as a means of redemption and rejuvenation, the very act of recording (no overdubs) serving as therapy. "Tonight's The Night" and "On The Beach" were pretty free records," Young pondered, lighting another unfiltered Pall Mall. "I was pretty down I guess at the time, but I just did what I wanted to do, at that time. I think if everybody looks back at their own lives they'll realise that they went through something like that. There's periods of depression, periods of elation, optimism and scepticism, the whole thing is.... it just keeps coming in waves. You go down to the beach and watch the same thing, just imagine every wave is a different set of emotions coming in. Just keep coming. As long as you don't ignore it, it'll still be there. If you start shutting yourself off and not letting yourself live through the things that are coming through you, I think that's when people start getting old really fast, that's when they really age. 'Cause they decide that, they're happy to be what they were at a certain time in their lives when they were the happiest, and they say 'that's where I'm gonna be for the rest of my life'. From that minute on they're dead, y'know, just walking around. I try to avoid that."